Replay General Room Escape info about the game-Games2Rule. In the year 1945, a Russian military man is trapped in a room in the F�hrerbunker. 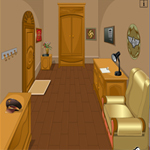 Help the Russian military man to escape from the room by using objects and hints.